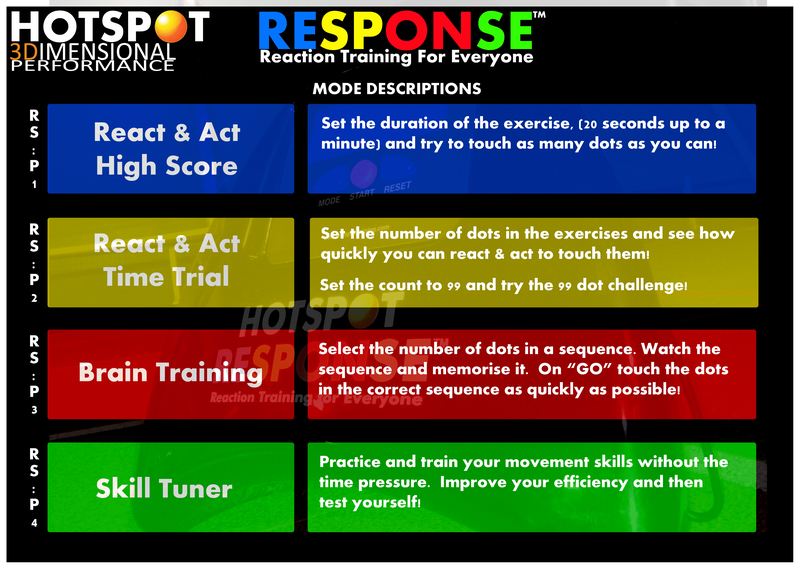 Hotspot response is a sensor based fitness training aid suitable for use by all in sport and fitness. It can be seen as a “game” by young users, used to measure specific aspects of movement by coaches and athletes or simply provide a fun and interactive means of getting moving and improving fitness levels. Up until now reaction trainers have been static but with Response™ you not only react to the lights but also move to the correct coloured spot on the ground. Activate with hand or foot for truly versatile training. Simply move a dot or two to create a new exercise challenge! The reaction now has purpose and the movement itself can also be trained. Whilst static systems do train hand eye co-ordination and reaction, they are limited in relevance in sport by there being no requirement to move. With Response™ the coloured lights on the base are merely the initiator – it is the following movement that really makes the system so game specific. The coloured spots can be placed in any position or pattern to create many variations of exercise. Have them close together for fast feet and positioning skills or spaced out for movement dynamics and fitness work. Response – React then Act – Reaction Training How it Was Meant to Be. 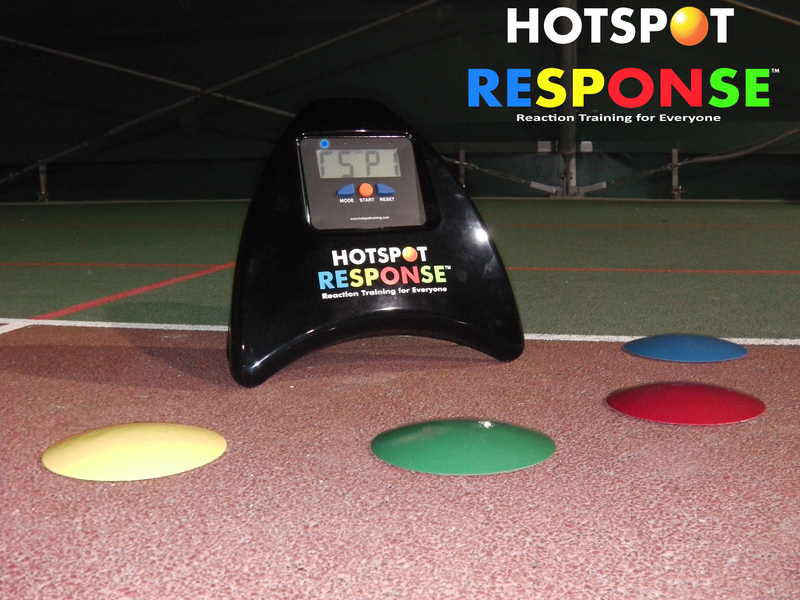 The Hotspot Response consists of 4 individually coloured sensors (red, blue, yellow, green) and a base unit. It has 4 modes of operation, rsp1-4, each with its own functionality and use. See descriptions in the image below! 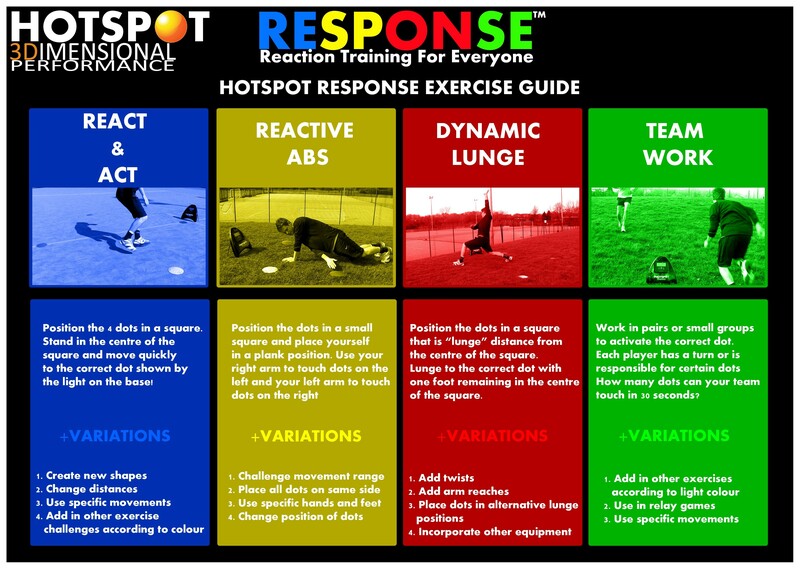 Hotspot Response can be used in a wide range of exercises with a whole host of progressions! Sorry accidentally deleted your info. Looking for pricing or catalog need email to citanmaui@gmail.com please.